Since Android hits mobile market and unleashes a wave of innovation, many iPhone users switch to Android. In this case, contacts may be the most important info you would like to migrate first to a new phone. However, Apple does not allow you to store contacts directly on SIM card. Of course, manually typing contacts info one by one is not a good idea. To deal with this issue, see how to transfer contacts from iCloud to Android. 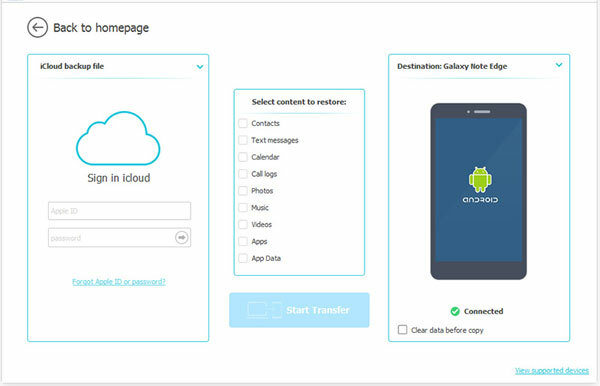 iCloud to Android Transfer is a professional software for transferring contacts from iCloud to Android. Its all around functions support selectively and completely one-click moving many formats of files from iOS to Android/ iOS to iOS, including contacts, photos, playlist, music, videos, movies, audio books, voice memos, iTunes U, Ringtones and Podcasts. It is smart enough to convert media files to be compatible with the target Android device. Also, you can keep both the original data and the moved files safely. iPhone XS, iPhone XS Max, iPhone XR, iPhone X, iPhone 8/ 8 Plus, iPad Pro, iPad Air 2, iPod touch 5/ 4, iPod Nano, Samsung Galaxy Note 9/ Note 8/ S9/ S9+/ S8, Sony Xperia X/ Z5/ Z5, Huawei Ascend P8/ P7, Ascend Mate8/ 7, HTC 10, HTC One X9/ M9, ZTE Axon Pro, ZTE Grand X3, LG G7/ G6/ G5 and so on. You can follow the steps to transfer contacts from iCloud to Android. Step 1. Choose the right version and download iCloud to Android Transfer on your computer. Here are two free trial versions for Windows/ Mac. Step 2. Connect your Android device to computer via a USB cable. Step 3. Once the program recognized your Android phone, please click "Restore from Backup" > "iCloud" from the screen shown below. Step 4. Sign in iCloud with your Apple ID and password on the left panel. Please make sure that is a "Connected" under your Android phone on the interface, if not, please replug it. Step 5. Enter your iCloud account and select the backed up contacts on the list backups, you can also select other files you want to move to Android device, please click "Start Transfer". Please notice that do not disconnect your Android phone until the transferring process is completed. 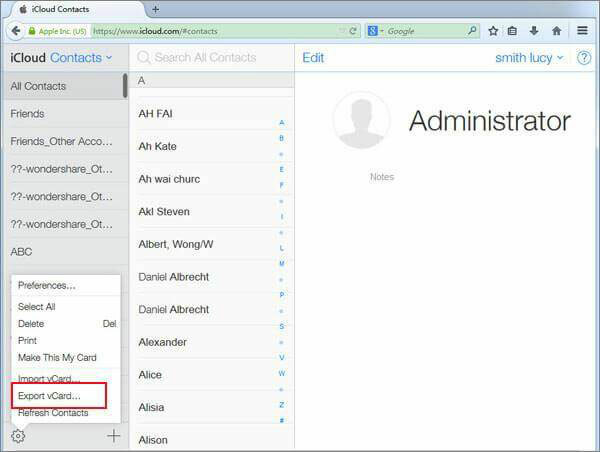 There are two strategies to export iCloud contacts to Android with the format of vCard file. You need to export the contacts to computer first, then use phone storage to import them to your Android or upload the contacts to the Gmail account which is used on your Android phone and sync them to your Android. Step 1. 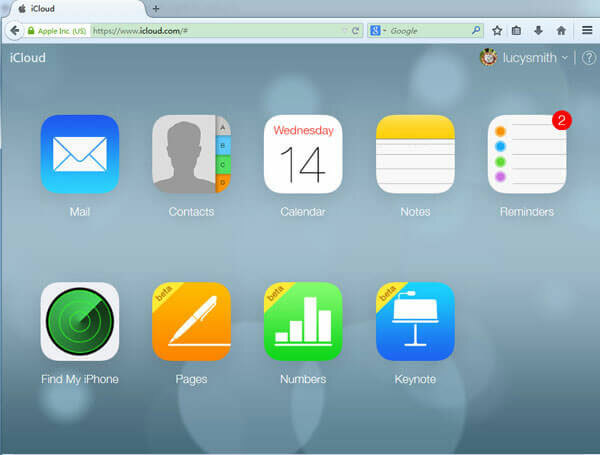 Log in your iCloud on the website, please make sure this account is synced to your iPhone. Step 2. After entering the account, please go to "Contacts", you can find all the contacts you backed up, please select the ones you would like to move to your new phone, or you can click the setting button and tap on "Select All". Step 3. After the contacts selection, you need to go back to the settings and click "Export vCard" to save the iCloud contacts in vCard format on your computer. Step 1. Connect your phone to computer and choose storage media mode. Step 2. Go to the location that you saved the vCard file, you can see a vcf file, please send it to your Android phone storage or you can manually copy and paste it to your phone. Step 3. Disconnect your Android phone and open its Contacts app. Click "Settings" > "Manage contacts" > "Import/ Export" > "Import from internal storage", the vcf file will be detected. Please select it and tap on "Import" > "Yes" to import the contacts. Step 1. Log in your Gmail on website, please make sure the Gmail account is used on your Android phone. Step 2. On the left panel, click "Gmail" from the drop-down menu and tap on "Contacts". From the top menu bar you can see a "More" button, please click it and choose "Import". Step 3. Go to the location that you saved the vCard file and upload it to Gmail. Step 4. You can now syncs the contacts to your Android device using the same Gmail account. 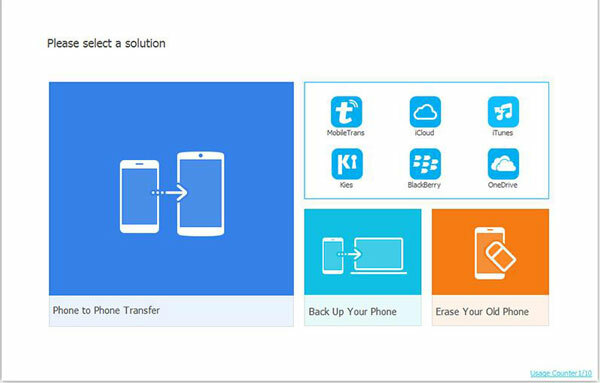 Samsung Smart Switch is a well-received app for files transfer between Android to Android and iCloud/ iOS devices to Android. With fewer functions than iCloud to Android Transfer, it can really migrate iCloud contacts to Android devices. Step 1. Download Smart Switch from Google Play store, install and run it on your Android phone. Step 2. Please select "iOS Device" and tap on "START" to go on. Step 3. On the next screen, please select "IMPORT from iCloud" and sign in your iCloud account using your Apple ID and password. Step 4. After logging in the iCloud, you can see a list of backup files under the "Basic information" screen, just simply select contacts and other files you wish to transfer to your Android phone, tap on "IMPORT" on the bottom to start the transferring. It may take a while for the files transferring up to the files' size. Once the process is completed, you can get iCloud contacts on your Android phone. It seems fewer users prefer sync iCloud contacts to Android with these apps. You can pick one to have a try as you do not need to pay for it. Sync for iCloud Contacts is a app designed to sync iCloud contacts between iCloud account and Android devices. With it, you can simultaneously sync contacts between iCloud and Android, this two-way synchronization do a great favor if you keep iPhone and Android phone at the same time. It is very easy to use and can also sync contact images. Sync Cloud Contacts on Android will not sync other accounts (Google, Facebook and so on) contacts to iCloud and it only sync those contacts that have been modified. Like Sync for iCloud Contacts app, it can sync iCloud contacts to Android in two-way synchronization. But only WiFi-sync is supported. How to Sync Android to iCloud?